Thanks I got the first one in the end! Now for 4b if I understand correctly we sub it in and then you're saying we get -1 and since it's mod we make it 1. But if we were to work out f(x) then we find two values??? f(-1) is always 2mod(-1) + 3 = 2 + 3 = 5. Can some on help. Normally to find the range you have to draw the graph. However this question is 3 marks and they differentiate it and get x=2. 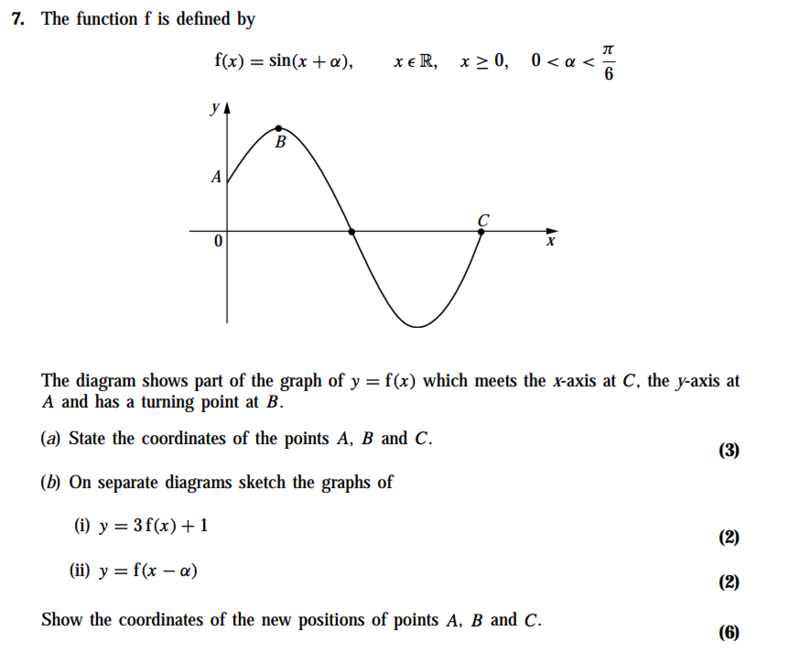 Is there a way that you can differentiate the function and find the range ? Hence, or otherwise, provetan^2π/8 = 3 – 2√2. Why is point C (π-α ,0) when surely it should be (2π-α ,0)? (Elmwood B). oh i see. But how would you know that curve has a max/ minimum? What's the hardest C3 paper and/or hardest trig "show that" question? Well if you really had no other way of finding out, d^2y/dx^2 < 0 for maximum and >0 for minimum.. But differentiating twice can sometimes be hard. If you're not given an equation, kinda just have to figure it out using general idea of the graph..
Why did you square both sides? Does squaring get rid of the mod? For the domain and range sometimes the mark scheme doesn't include x/f(x) is equal to all real numbers. I f you do include it do you loose marks? Oh really. I didnt know lol. So if you had to draw say f(x)= 2|x| +3 do you square it or ..? For 10c, I got to the stage 1/sinx - 3cosx = 0 not sure where to go from there??? LOL sorry i was joking, don't try working it out because it doesn't exist lol. Never seen the vine?